If you love applique, you'll enjoy making this beautiful quilt designed by Edyta Sitar of Laundry Basket Quilts. This classic beauty makes a stunning wall quilt that finishes at 54" x 54". You will receive 2 blocks for 12 months and on the 13th month fabric and pattern to construct the center block and borders. Explore Carolyn's chosen topic and see several examples from her vast collection. She will encourage questions and you are invited to bring a quilt to share for 'show-and-tell' at the end of the sessions. Join us on Friday, January 17, from 10-12. 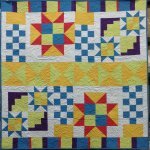 Join M.J. for this comprehensive look at beginning quilting from the ground up beginning Monday, January 27, from 10-1. M.J. has 50 years of quilting experience and is a master quilter. She will teach you how to make a quilt you will be proud to show off. Join Penny as she shares with you her love of the art of Punch Needle. Together you will work on a piece and learn the tips and tricks to completing these beautiful little works of art. Class is held on Wednesday, January 22, from 10-3. Register here.